One of my New Year's "To Do List" [I don't make resolutions] items was to take a cooking class. After searching for classes in the area, I came across Sur La Table. I searched their calendar for dates that would work with my schedule and it just so happened a Risotto Workshop was available! I took the class with Laura, a friend of mine from high school. We had a great time cooking and catching up. Our class was small (only four of us) and there were four risotto recipes... sooo as you probably guessed, we each took on a recipe! Tammy, our instructor, was wonderful. She had an obvious passion for cooking, which made for a fun night. Since our class was small, we got a lot of one-on-one instructions, "complementary" glasses of wine, and we learned proper knife techniques! Melt 1½ Tbsp butter with EVOO in heavy large saucepan over medium heat. Add shallots and sauté until tender- about 6 minutes. Add rice; stir 1 minute. Add wine and stir until evaporated. Add hot broth; simmer until absorbed, constantly stirring. Add remaining broth ½ cup at a time, allowing broth to be absorbed before adding more and stirring frequently until rice is creamy and tender, about 35 minutes. Stir in Parmesan cheese and remaining 2 Tbsp butter. Stir in parsley, lemon juice and lemon peel. Season with S&P and serve immediately. Heat the stock and ladle 2 cups into a medium bowl. Add dried mushrooms and let soak for 20 minutes then drain, reserving the liquid (you have to rehydrate dried mushrooms!) Pour liquid through a sieve lined with cheesecloth or paper towels to catch any dirt and grit. Add mushroom liquid back to warm stock. Keep stock heated over medium heat. Pat soaked mushrooms dry and sauté in a large skillet with 1-2 Tbsp EVOO. Heat remaining EVOO in a large, heavy saucepan over medium heat. Add shallots and cook until softened. Add rice and cook, stirring, until the rice becomes translucent, about 3-5 minutes. Add wine and stir until absorbed by the rice. Add warm mushroom stock to rice, 1 ladle at a time, stirring constantly. All stock must be fully absorbed before the next ladle of stock is added. After about 20 minutes, the rice should be tender, but not mushy and it should have a creamy texture. At this point, you can add hot water if your stock has been depleted. Let stand for one minute before serving. **I do not like mushrooms, but ate every last one in this dish! I guess I like dried mushrooms rehydrated in chicken stock! In a large skillet melt butter over medium heat. Add squash and season with salt. Cook for 6 minutes, until golden on all sides. Add brown sugar and cook until the squash is caramelized and tender, but not mushy. Bring chicken stock to a boil oven high heat. Reduce the heat to low and keep warm. Heat EVOO in a heavy bottomed sauce pan; add pancetta and saute until lightly brown; add shallots- stirring until softened. Pour in the Arborio rice, sage and thyme; cook for 4 minutes, stirring until well coated. Turn heat to high and add the white wine; simmer until mostly absorbed. Add the hot stock ½ cup at a time, stirring constantly until absorbed by the rice. Continue to add stock ½ cup at a time, stirring to release the starch. Check rice for done-ness after 18 minutes; rice should be al dente but cooked through. Stir in Italian parsley and S&P. Gently fold into the squash. Over medium heat, melt the butter and cook 2-3 minutes with sage until it begins to brown. Pour over risotto once risotto is finished. Bring milk, sugar, and vanilla beans to a bare simmer over low heat for 10 minutes to infuse vanilla flavor. Remove the bean pods and keep the milk hot. Heat 2 Tbsp butter in a large saucepan over moderate heat. Stir in the rice and cook, stirring until the rice is hot, about 2 minutes. Begin adding the hot milk, 1 ladle at a time, stirring often and adding more milk when the previous addition has been absorbed. Adjust heat to maintain a nice simmer. It will take about 20 minutes for the rice to become creamy and al dente. *It is possible you may not need all of the milk. Remove risotto from the heat and stir in the remaining butter and chopped chocolate. Sprinkle with chopped hazelnuts, shave white chocolate over the top and serve. Last year I joined the Cooking Club of America (which turned out to be a joke.) However, one of the perks was that I was able to be a recipe tester! I made these lettuce wraps last summer for my family. The recipe is from Mahatma Rice. Heat oil in a medium non-stick wok or skillet over medium-high heat. Add garlic and ginger and sauté 30 seconds. Add chicken and cook until no longer pink, stirring to break-up any clumps. Add cooked rice, stir in soy sauce, water chestnuts, cilantro and sesame oil. 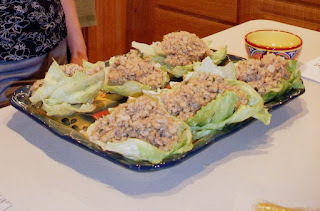 Place about ½ cup mixture into each lettuce leave. Garnish with a lime wedge and chopped mint. My mom's recipe is always a hit! 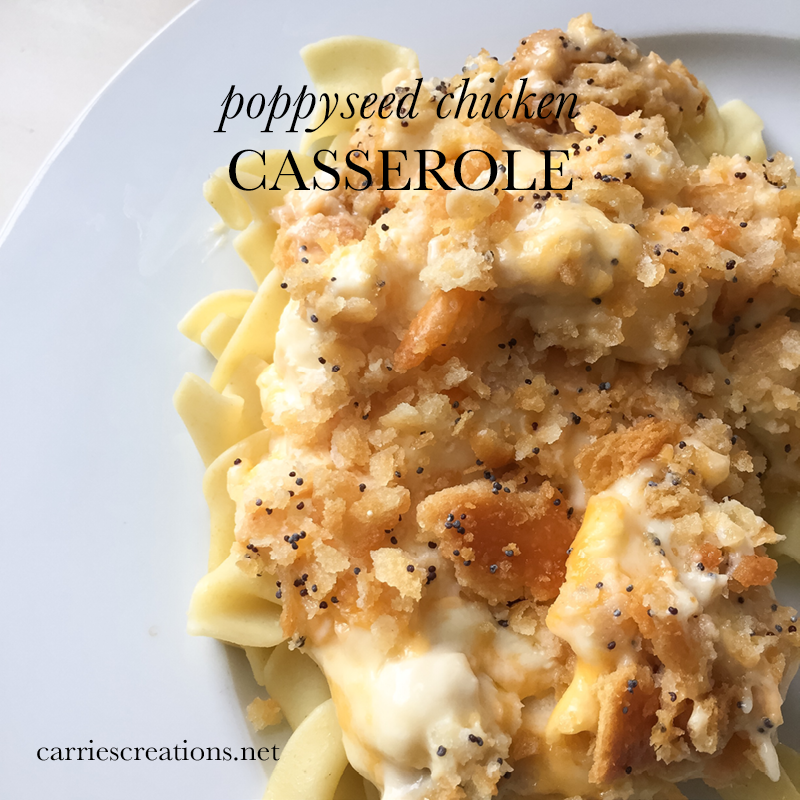 Casseroles are such a comfort food for me, as they always remind me of when I was a kid. After you cook and dice the chicken, the rest is so simple. You can make it the morning of and pop it in the oven right before you're ready to eat. Recipe makes enough to fit a 9x13" baking dish. Distribute diced chicken evenly on the bottom of a greased 9x13" pan. Mix the ingredients in part II and spread over the chicken layer. In a bowl, drizzle melted butter over crushed Ritz crackers; gently stir so all crackers are coated. Pour mixture over previous layer. Sprinkle with poppy seeds. Bake at 325°F for 20-30 minutes or until the edges are bubbly. Serve over cooked egg noodles. I hope you enjoy as much as my family does! Another Greek favorite and healthy dip/spread. Enough said. Mix all of the ingredients together. Cover and chill for at least 2 hours before serving. Serve with Pita chips (I like Stacy's Simply Naked) or pieces of pita bread. This will keep in the fridge for a few days too! Put it on a sandwich in place of mayonnaise. As a sauce/topping for salmon. The first time I heard of tempeh was through the Tone It Up! girls. They are certified fitness instructors and nutritionists based in Hermosa Beach, CA. Fun job! I love their recipes because they are so lean and healthy for you. Tempeh is made from soy (similar to tofu, but with a different texture and flavor.) It is very high in protein and contains all of the essential amino acids. Tempeh is also high in fiber, like that of grains and beans. This recipe is vegan and gluten free. I am neither but I do like to incorporate vegan and gluten free meals into my diet. Spray a medium skillet with non stick cooking spray. Cook tempeh strips over medium heat for about 5 minutes or until heated through. Add flavoring once you place the tempeh in the skillet. Toss all remaining ingredients together in a bowl. I really loved this meal. It was so simple and light. Even my parents liked it! Enjoy! I looked at many different risotto recipes and selected the best ingredients from them to come up with my very own. This dish is so therapeutic to make! I made this dish for the first time this past November; however, it can be enjoyed any time of the year and is best with all fresh ingredients. I purchased four servings of salmon fillets the same day I made this dish. Place salmon fillets in a baking dish. Pour ½ to ¾ of a bottle of Italian dressing into the baking dish. Arrange freshly sliced lemon and dill onto each fillet. Bake at 350°F for about 30 minutes. Bring broth to a simmer in a medium saucepan; turn heat down to low; cover to keep warm. On another burner, heat EVOO in a medium pot over medium heat. Add the onion and S & P to taste. Sauté until translucent. Add Arborio Rice and sauté until translucent. Add a ladleful of broth to the rice and stir constantly until absorbed. Repeat this process until you have used the broth. It will begin to take longer for the broth to be absorbed; rice will take on a creamy texture. Add the wine and stir until absorbed. Stir in some of the Parmesan cheese. Zest the lemon and save for garnish. Squeeze juice from the lemon and add to risotto; stir until absorbed. Remove from heat and season with salt and pepper. Top with remaining Parmesan Cheese; Garnish with lemon zest; Serve immediately.